When you start doing some Machine Learning, you go through a batch-oriented process: you take a dataset, build a Machine Learning model from this data, and use the model to make some predictions on another dataset. Then, you want to apply this process to streaming data, and this is where it can get confusing! Let's see what you can do in streaming and what you cannot do. You can build a regression model so that, when there is a new house to sell, you can estimate what the selling price will be, e.g. a house of 2000 sqft with a lot of 0.5 acres might sell around $250,000. The first mistake people make is to think we can update the model when we receive a new house to sell. We can't, because the new piece of data is an unlabeled record: we know the characteristics of the house, but we don't know its selling price (yet). It is only once the house has been sold that we can enrich our training dataset with a new record. The second usual mistake is to think we should update the model every time we have a new labeled record (a house was sold and we know its selling price). Well, we could, but it is probably not a good idea to do so. Training a model may require doing some cross-validation, going through a grid-search to optimize our parameters, and we may even try multiple algorithms. All of this is makes the process very resource-intensive. It is also a good idea to have a human verify that the model performs as expected before using it in production. And who knows, the real estate market may be going through a bubble, and you may want to refine your dataset to only keep the last 3 months of data. Basically, what I am trying to say is that your Data Scientist should decide when to update the model. More generally speaking, when you update your model incrementaly, i.e. as you receive new training examples, we talk about Online Machine Learning. However, few algorithms allow that. The training process should be done in batch, from time to time, with a fixed dataset, and will produce a model. A streaming application can use the model (without updating it), and we may need to update the application when a new model is produced. scikit-learn and Tensorflow: two popular Python libraries. Spark ML: a library built on top of Apache Spark. cloud-hosted Machine Learning services, such as Google Cloud Machine Learning Engine or AWS SageMaker. H2O.ai: a mostly-Java based platform. 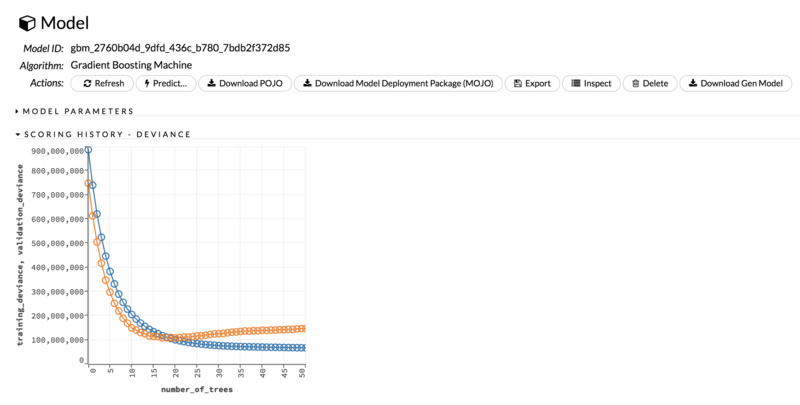 scikit-learn and Tensorflow: since these are Python libraries, your best bet is to expose the model on a REST API, and call the API from your Java application. Serving the model - and potentially scaling it - requires some work, though. Spark ML: you will most likely have to use Spark Streaming, which comes with its set of challenges (high latency, complexity when updating an application, etc.). Cloud-hosted services: these are API-based, and therefore very easy to integrate, but latency might be too high if you need to make your predictions with a very low-latency. H2O.ai: this platform allows you to download the model as a POJO (a Java class) that you can integrate in your application. This is what we are going to use in this post. H2O.ai is an open-source platform for Machine Learning, and the company behind it also offers paid support as well as paid products enterprise products. In this post, we are going to use the free product. Now, let's use our model in a Java application (we're actually going to use Kotlin, but this is a JVM-based application). Great, we just used our Machine Learning model in a standalone application! We are going to build a Kafka Streams application to process this stream and make predictions as new records arrive. The selling_price property is the value we will predict. We will use it when we output predictions to another Kafka topic. We saw in this post how we can embed a Machine Learning model in a Kafka Streams application. The model was built outside of the streaming pipeline, and the generated POJO was completely independant from the platform where the model was trained. A/B testing of different models is also more difficult. Hopefully this article lifts some interrogations about how to use Machine Learning in streaming. Let me know if it helped!